Sienna Miller in American Sniper and Foxcatcher, doing what reactresses do. Her roles in these films might make you wonder, though, what exactly was on that audition tape. As the wife of Mark Ruffalo’s doomed David Schultz in Foxcatcher, Miller’s Nancy has a mere handful of lines, and her biggest scene—in which she sobs into the aforementioned phone as dramatic music swells after her husband is shot—is dialogue-free. In American Sniper, after an early scene in which her character acts flirtatiously prickly to Bradley Cooper’s Chris Kyle in a bar, her character flattens out almost immediately, turning into the film’s Greek chorus, speaking only to explain how life at war has changed her man. She is trapped in a sad little emotional cycle: as Kyle comes home from war, then leaves, then returns to do it all again, she’s basically a sounding board for his private torment. 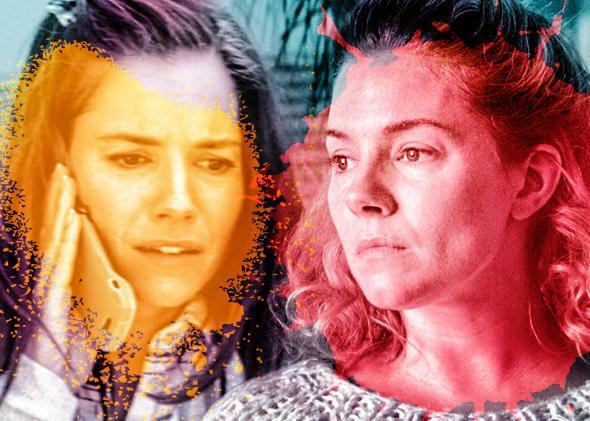 You could call it the plight of the “reactress”: female stars cast in roles that require little more than glumly registering the drama dished out by their male counterparts. This problem isn’t Sienna-specific. Keira Knightley got a Best Supporting Actress nod for her role in The Imitation Game; she plays a genius mathematician who isn’t too busy to spend almost all of her time soothing the fevered soul of Benedict Cumberbatch’s way more genius mathematician. Even Emma Stone’s character in Birdman is mostly a way to signal the inattention and selfishness of Michael Keaton’s Riggan Thomson—she has all the requiste damaged tough-chick traits, the tattoos and the chain-smoking, but nothing she does feels particularly surprising. The last moment of the film is, quite literally, a shot of her reacting to her dad. Needless to say, thinly drawn supporting roles for women in prestige films are nothing new. Many of the most acclaimed films of the past half-century are filled with female characters whose own personalities and motivations are mostly beside the point. Why does Kay suffer through her relationship with Michael Corleone in the first Godfather film? What drew Wendy Torrance to a loose cannon like her husband Jack, back before he was chasing her through the halls of the Overlook Hotel, in The Shining? These films, while frustrating, are at the very least straightforward about their lack of interest in fully fleshing out these female characters. But over the past few years, the reactress has been repackaged in a new way. We’ve seen a flood of supporting roles designed to be played by high-profile actresses in high-profile films, written to suggest that the characters possess depth and a vaguely feminist sense of liberation—qualities that never seem to interfere with the character’s ability to neatly slide into the same old “concerned girlfriend/wife/confidante” role. The reactress might recall the “Cool Girl” trope coined by Gillian Flynn, via Amy Dunne in Gone Girl—that laidback nymph who watches sports and downs cheap domestic beer because she thinks it’s what men want. But the reactress isn’t engineered as a kind of male fantasy. She’s a Hollywood fantasy: a character designed to fit squarely into the age-old prestige drama formula while giving the impression that she’s somehow new. It’s no secret that decent big-screen roles for women are still hard to come by. Such criticism has been issued by everyone from Cate Blanchett in her 2014 Oscar acceptance speech, to USC’s Annenberg School for Communication & Journalism, which conducted a five-year study on women in popular film, and found that less than 33 percent of speaking roles in films are given to female characters in any given year. Aaron Sorkin was rightly vilified for claiming, in an email to New York Times columnist Maureen Dowd that was unearthed in the Sony hacks, that “the guy who wins the Oscar for Best Actor has a much higher bar to clear than the woman who wins Best Actress.” But still he speaks for much of Hollywood in claiming that in a serious movie, men do the acting while women try hard not to pull focus. So the reactress role feels, at first glance, like a response to all this. She’s no doormat—a fact that is telegraphed in quick, superficial ways. American Sniper’s Taya swears like a sailor and parties like one too, attempting to drink Navy SEAL Chris Kyle under the table upon meeting him. Foxcatcher’s Nancy uses her one moment of dialogue to stand up to her brooding, bullyish brother-in-law. The Imitation Game’s Joan Clarke is a female mathematician, a job that was pretty much unthinkable circa World War II, and one of her earliest scenes involves whizzing through a difficult crossword puzzle to beat out a roomful of male competitors who are angling for the same gig. This character had so much potential, and yet in the end the part largely required talking fast and making googly eyes at Benedict Cumberbatch. Reactresses help a film prove that it is forward-thinking, that it is not part of the problem. “We tried!” these movies seem to say. “Hey, at least it’s better than what ever roles for women were in the last Transformers movie, right?” It’s as if Hollywood received some kind of memo about writing better parts for women, but only skimmed it for talking points while also watching The Bachelor. The patient zero of reactresses might be Jennifer Garner in Dallas Buyer’s Club. Garner’s character, Dr. Eve Saks, like all reactresses, is a free-thinking rebel on paper. She’s a young female doctor in 1980s Texas who decides to reject the medical establishment’s methods of treating AIDS after her experiences talking to real AIDS patients, and becomes radicalized enough to drop anti-AZT flyers in a children’s AIDS ward, losing her job in the process. Pretty intense stuff, right? But Saks doesn’t exist to be a character study of an idealist who realizes that she’s actually working for the bad guys; she exists to shine a reflected light on Matthew McConaughey’s more complicated, AIDS-afflicted cowboy, Ron Woodroof. The closest we get to an emotional payoff for her character is when she smashes a wall with a hammer in frustration—but even that barely makes a few dents. There’s clearly nothing wrong with making a movie about one man’s emotional struggle. (Though it would be great if we could start, you know, making an equivalent number of films about one woman’s emotional struggle.) But rather than bring us closer to a world full of tough, complex parts for women, reactress roles offer little more than pseudo-progressive window dressing. And in a year in which none of the films featuring Best Actress nominees—with the exception of The Theory of Everything’s Felicity Jones—were themselves nominated for Best Picture, the problem is even more glaring. “Even if we still won’t give the same amount of acclaim to films about women’s struggles as we do to films about men’s,” the movie industry seems to be saying, “at least we’ve got some good roles for women tucked into those stories, the kind of star turn that might just launch you onto the cover of Vogue.” Hollywood would even be wise to take notes from some of its less Oscar-baity offerings: Amy Dunne might be a psycho killer, but a reactress role she is not.